Objective: Use ladders safely for construction and maintenance jobs. Read the information below on ladders and safe ladder practices. Ask your supervisor to demonstrate ladder hazards and ladder safety. Practice using the four-to-one rule while your supervisor observes. Take the True/False quiz to check your learning. Most ladder injuries happen when someone falls from a ladder or when the ladder falls because it is being used incorrectly. Consider the type of work to be done when choosing a ladder. Be certain the ladder is able to carry the amount of weight that will be applied. Check ladder ratings for weight allowed. Industrial: Heavy-duty with a load capacity of not more than 250 pounds. Commercial: Medium-duty with a load capacity of not more than 225 pounds (suited for painting). Household: Light-duty with a load capacity of 200 pounds. Check the condition of the ladder using the Ladder Inspection Checklist on the next page. Make sure the ladder is placed on a firm, level, slip-free surface away from things like algae growth, oil droplets, potting mix, or wet grass clippings. Check for overhead power lines outdoors and remain clear of them. Check for lighting fixtures indoors and remain clear of them. Sharp edges? Splits? Loose components? Bent steps or stiles? Chips? Cracks? Condition of no-slip or slip-resistant rubber or plastic feet? Loose steps or rungs? Chips? Be certain the spreader is locked before climbing on the ladder. Never stand on the top of a stepladder. Make sure all four feet are on a solid ground or floor surface. 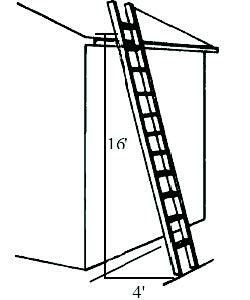 Raise the extension ladder to the desired height and lock both sides. Never stand on the top three rungs of a straight or extension ladder. Don't lean a ladder against a movable object. Always face the ladder and hold onto the side rails with both hands, when going up or down the ladder. The ladder should be placed according to the four-to-one rule. First, measure the rise of the ladder—the height from the ground up to the point where the ladder rests against the object. For every 4 feet of rise, the base of the ladder should be 1 foot away from the object. For example, if a 16-foot ladder leans against a wall, its base should be placed 4 feet from the wall. Keep ladders away from power lines. Always raise the ladder three rungs above a roof line. Never use a ladder in a strong wind unless it is tied securely. Never use a ladder in front of a door unless the door is locked, blocked, or guarded and signs are posted. Inspect ladders for potential dangers before using. Keep your body centered between the rails of the ladder. Always have three points of contact while on a ladder—for example, two feet and one hand. Never carry tools or materials in your hand when going up or down a ladder. Use a tool belt or apron with a pocket. If you must work near power lines, always use a wooden or fiberglass ladder. Never work with a metal ladder around power lines. Choose the right ladder for the intended job. Know the potential hazards when using a ladder. Know the proper placement of ladders.